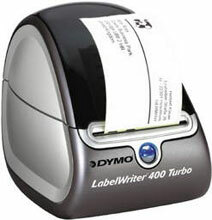 It is replaced by the Dymo LabelWriter 450 Turbo. LabelWriter 400 Turbo prints professional-looking labels with your favorite fonts and graphics (up to 2-1/4" wide - 56 mm) at a fast 55 labels per minute! LabelWriter 400 Turbo saves you time and money, because it uses no ink or toner. High resolution printing means crisp text, graphics, photos and barcodes. The only supplies you'll ever need are the labels. Direct thermal label printer, 55 labels per minute, USB. Includes Printer, power supply, USB cable, Windows and Macintosh software and Users Guide on CD-ROM, printed Quick Start Guide, one roll of address labels one starter roll of DYMO Stamps. White Address labels, 1 1/8" x 3 1/2", 350 labels/roll, 2 Rolls per Box.